Quick one today since my cat wants snuggles and I’m not one to deny her. 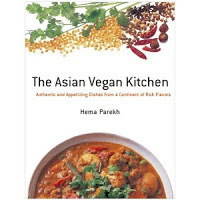 Today’s book is The Asian Vegan Kitchen by Hema Parekh. Parekh gives a sampling of recipes from around Asia. She covers better known cuisines like Indian and Chinese, but also devotes chapters to underappreciated areas like Malaysia and Burma. The recipes are all accessible to home cooks, with surprisingly few ingredients that couldn’t be found in an ordinary grocery store. In some cases, this accessibility means toning down the authenticity, but in this case I appreciate it. Books that focus on presenting a truly authentic view of a country like Burma: Rivers of Flavor or Pok Pok are often ‘special occasion’ books, for those weekends where you want to spend all day in the grocery store and all evening tinkering away in the kitchen. The Asian Vegan Kitchen is truly a weeknight, home cooking kind of book, with many of the recipes coming from her own weeknight repertoire. This book is an especially interesting specimen of vegan cookbook because she does not harp on the fact that she is veganizing often very fishy meals. Some swaparoos are obvious, like the teriyaki tofu steak. In other cases, she just picks naturally vegan or “all but the fish sauce” dishes, like the delicious Japanese Braised Onions and Potatoes. In this sense, the book is very much like The Mediterranean Vegan Kitchen. Not every cookbook needs to be full color or elaborate. Some just need to be useful, and this book definitely falls into that category. This entry was posted in Cookbooks, Reviews, VeganMofo and tagged Asian, vegan, veganmofo2013, vegetarian. Bookmark the permalink.